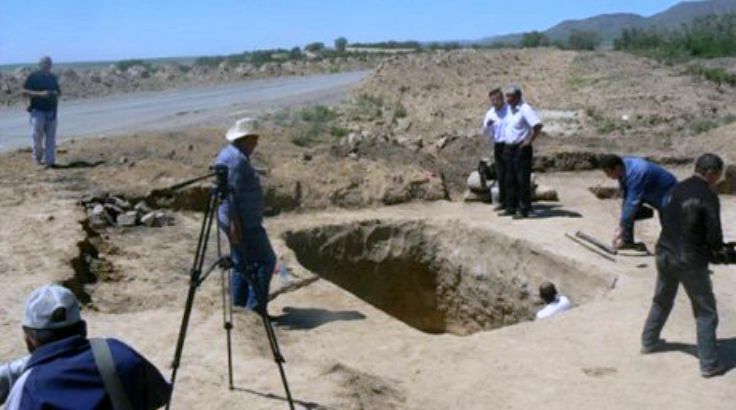 KAZAKHSTAN – Urdzhar - Archeologists in Kazakhstan have discovered the ancient grave of a young woman who has acquired the nickname “Princess of the Scythians.” The elaborate tomb was found in Urdzhar district in eastern Kazakhstan during road repairs, Tengri News reports, quoting expedition leader Timur Smagulov. A team of lecturers and students was called in to investigate, and the group unearthed a stone sarcophagus containing the body of a young girl. The “Princess of the Scythians” was clearly a prominent figure, judging by the treasures buried with her, most notably a gold headdress decorated with figures of animals and topped with arrowheads. It is similar to the one worn by Kazakhstan’s most famous archeological find, the Golden Man – a Scythian warrior prince interred wearing some 4,000 gold ornaments. This type of headdress was part of the ceremonial clothing that the leaders of the Scythians – who inhabited the Eurasian steppe in ancient times – used to parade in, Smagulov said. “It is quite possible that the buried woman was the daughter of a king of the Saka Tigrakhuda tribe.” The grave – which also contained ceramics and the bones of a sacrificed sheep – is believed to date from the 4th or 3rd century BC, the same period as the Golden Man’s burial site. Amazing archeological finds are nothing new for Kazakhstan. Back in 2010 archeologists discovered the tomb of a gold-clad ancient Scythian warrior, nicknamed “The Sun Lord,” whose torso was entirely covered with gold. 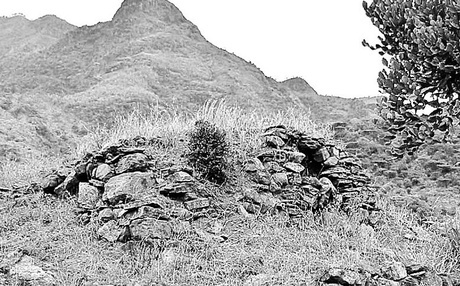 INDE – Amairkaradu - In a discovery that is expected to throw light on burial or funeral practices in the Southern parts of the state in the pre-historic era, a group of archaeologists on Sunday found four dolmens (portal tombs) that are believed to be more than 3,000 years old at Amairkaradu near the Western Ghats in Palani. V Narayanamoorthy, Secretary of the Tamil Nadu Archaeology Research Institute, who led the team that discovered the relics, told Express that the find confirms Palani’s importance as a major site that has several traces of ancient history. “For the past five months, we found many inscriptions and stone structures in Palani,” Narayanamoorthy affirmed. He explained that the dolmens would help archaeologists understand ancient funeral rites that had long existed in Tamil Nadu. “People would place a body in between stones that had been carved for the purpose and close it with a large size rock on top,” said Narayanamoorthy. While three of the dolmens were found with significant damage and offered little prospect for extensive research, the fourth one was unique for its small size. This structure is 6.32 metres long and about 5 metres wide and was built using small stones and plaster. He said this was a rare find in Asia as other dolmens discovered in the continent were built using much larger stones. Local residents used to call this dolmen ‘Pandyan Veedu’ (King Pandya’s Home) as they believed that one of the kings of the Pandyan dynasty was buried here. However, Narayanamoorthy said this was likely to be a false belief. USA – Fieldsboro - White Hill Mansion has been many things during its two-plus centuries of existence: posh residence, restaurant, speakeasy, even a trysting place for politicians and their mistresses. For some 50 Monmouth University archaeology students gathered on the grounds Saturday, the decaying mansion became a portal into the past. For the next six weeks, the students — augmented by volunteers from the Friends of White Hill Mansion historic preservation group — will dig up selected areas of the White Hill Mansion’s grounds in search of artifacts that will fill in the picture of Colonial-era life. Veit also supervised a 2011 dig that turned up shoe buckles, ceramics and Lenape Indian artifacts. Ground-penetrating radar turned up evidence of buried foundations for long-vanished buildings, but no signs of the tunnels local history buffs believe are still present around the mansion. Along with rumors of tunnels, the mansion also is the focus of stories of ghostly presences. Websites devoted to the paranormal refer to White Hill Mansion as a haunted house. QATAR – Al Zubarah - Qatar’s Al Zubarah Archaeological Site, which has outstanding universal value as the Gulf’s most complete and well-preserved pearl trading and diving town of the 18th-19th centuries, is likely to be inscribed in the Unesco World Heritage List. Qatar’s largest and most impressive archaeological site, the abandoned coastal town of Al Zubarah, with 60 hectares of ruins within its former walls, is situated about 100km to the northwest of Doha in the district of Al Shamal. The settlement was founded around 1760 by the Banu Utba tribe from Kuwait, seeking to create a safe trading haven in the Gulf, as other long-established ports were destroyed, occupied, or ridden with plague. Over a very short period of time, Al Zubarah, quickly rose to become the foremost centre for pearl-based trade and commerce in the region, and Qatar’s largest and most important town. Its location in central Gulf was instrumental in making Al Zubarah the premier pearling and trading town in the region after the decline of Basra in Iraq. Al Zubarah Archaeological Site represents the only complete urban plan of an Arabian pearl-merchant town, with its unique combination of neighbourhoods, mosques, palaces, markets, defensive systems and a canal. The town plan of Al Zubarah encapsulates and preserves key ideas about urbanism and town planning during the 18th-19th centuries, and it is the best-preserved record of its type. In 1811, Al Zubarah was destroyed by Omani forces and never recovered. The town survived until the end of the 19th century as a small pearl fishing community only to be gradually abandoned during the first half of the 20th century. The Nominated Property includes the entire town, harbour, canal, screening walls, cemeteries, and Qal’at Murair – a square fortified settlement 2.5km to the south of Al Zubarah – the purpose of which was to guard a series of freshwater wells that were essential for the survival Al Zubarah, as the harbour town had no fresh water on its own. Opposite to Qal’at Murair, destroyed in the latter part of the 20th century and survives today largely as sub-surface archaeology, is Al Zubarah fort, the best preserved feature, built in 1938 by Sheikh Abdullah bin Jasim al-Thani as part of a complex defense system to protect Qatar’s northern coastline. Al Zubarah was first reported as an archaeological site by a Danish-led team in the 1950s and excavated in 1980 by Qatar’s National Council of Culture, Arts and Heritage and between 2002 and 2005 by the QMA. INDE – Chatra - Dig a drain, stumble upon a treasure-trove of Munda history. Municipal labourers digging in Lutidih village, Chatra-Ranchi Road, in mid-May, accidentally spliced five menhirs, little knowing there lay buried a fascinating saga of Munda tribesmen of the Iron Age, circa 7th century BC. In India, the megalithic burial culture is scattered in Odisha, Bastar in Chhattisgarh, Jharkhand, Northeast, south India and even Kashmir. Megalithic burials are marked by menhirs, pots, stone circles and slabs, sarcophagi, urns, among others. In Jharkhand, ancient tribes normally erected menhirs — large stones in an upright position — above pots as tombstones to honour their dead. “A drain was to be constructed at Lutidih. When I received word from local residents that a trench unearthed ancient pottery, I rushed with a team to Chatra from Ranchi. By the time we reached, a number of menhirs had been found as well,” Sinha, who retired in October 2011 but worked on contract till May 2013 as an archaeological consultant with the state, said. “The discovery of menhirs calls for more detailed excavation work at Chatra which may eventually throw light on the ancestry of Munda tribe in Jharkhand,” Sinha stressed. The system of burial unearthed in Chatra was this. A red clay pot was filled with bones and ashes of the dead. On top of it, smaller pots were placed successively in a pyramid form. Thin stone slabs covered the pots. Finally, a menhir was erected to mark the site. “Some edibles may also have been placed in the pots for the dead, indicated by the number of broken pots discovered at the site. From stylistic details, it appears to be around 6-7th century BC,” he said, adding that carbon-dating would fix the time accurately. In other parts of the country, excavation of burial sites of the megalithic people has uncovered a variety of iron weapons such as swords, spears or javelins, historically marking the Iron Age. Studies reveal the ancient warrior tribes were nomadic people who buried their dead on their way and erected menhirs to mark the places. “Similar pot burials were found at Nevasa and Inamgaon, Maharashtra, where excavations have been done by Deccan College, Pune, but those burials date around 1,800 BC,” he said. INDE – Palacole - Ancient coins have been discovered from underneath the Dwajasthambam of Ksheera Ramalingeswara Swamy temple at Palacole town in West Godavari district. Temple authorities, who were restoring the Dwajasthambam that fell down last year, were astonished to find a large cache of gold, silver and copper coins inside the foundation. They had dug up the foundation of Dwajasthambam to install a new one. 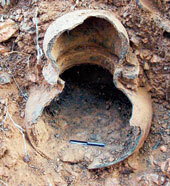 The temple authorities have informed officials of the state archaeology department. The period of the coins and their historical and archaeological value is yet to be ascertained. They also found a Kurma Yantra from the site. Ksheera Ramalingeswara Swamy temple is one of the Pancharama kshetras in Andhra Pradesh. Great religious and historical significance is attached to the temple. Thousands of devotees from all over the state visit the temple and offer prayers to the presiding deity. Religious legends trace the history of the temple to the period of Ramayana.